The Tribe is playing the Red Sox in a day game today, so Russell and I decided to head down to Boston and catch a game at Fenway — the iconic ballpark where all of the greats have played. It’s pretty cool to be here, and if you’re a baseball fan who knows the history of the game, it doesn’t get any better than a game at Fenway or Wrigley Field. We’re in Section 553 for today’s Tribe game. That’s in the top half of the upper deck. The game is a sellout and these were the best seats I could get. Although we’re far above the field, I like the bird’s eye view. We won’t be able to call balls and strikes or heckle the opposing players from up here, but it’s also fun to watch the defensive adjustments and see what’s happening in the bullpens, too. Plus, you get a good view of downtown Cleveland. A perfect night for baseball as Corey Kluber mowed down the Angels and the Tribe won a well-played ball game. Now, it’s time for some fireworks! This morning, Cleveland Indians fans are dealing with that familiar gut-punch feeling of deep disappointment. Last night the Tribe got bounced from the playoffs by the New York Yankees, and the magical 2017 season, which saw the Indians set an American League record of 22 straight wins and win more than 100 games for only the third time in the team’s history, is abruptly over. The loss means that, when next year rolls around and the Tribe tries again, it will be a full 70 years — 70 years! — since Cleveland last won a World Series. It’s now the longest such streak in Major League Baseball. The fact that the Tribe lost to the Yankees, the perennial winners who have taken home more than a dozen World Series titles since the Cleveland last hoisted a World Series championship banner, makes the loss doubly painful. The fact that the Indians lost after leading the series 2-0, notching an improbable comeback win in game two, and putting the Yankees on the brink of elimination, before collapsing in an uncharacteristic haze of errors and offensive futility — well, that just shoves the pain into the brutal, off-the-charts category that long-time Cleveland fans know all too well. Watching the game wind down to its ugly conclusion last night, I saw the pictures of overtly prayerful Tribe fans hoping against hope that this year the result might be different — and I knew exactly how they felt. 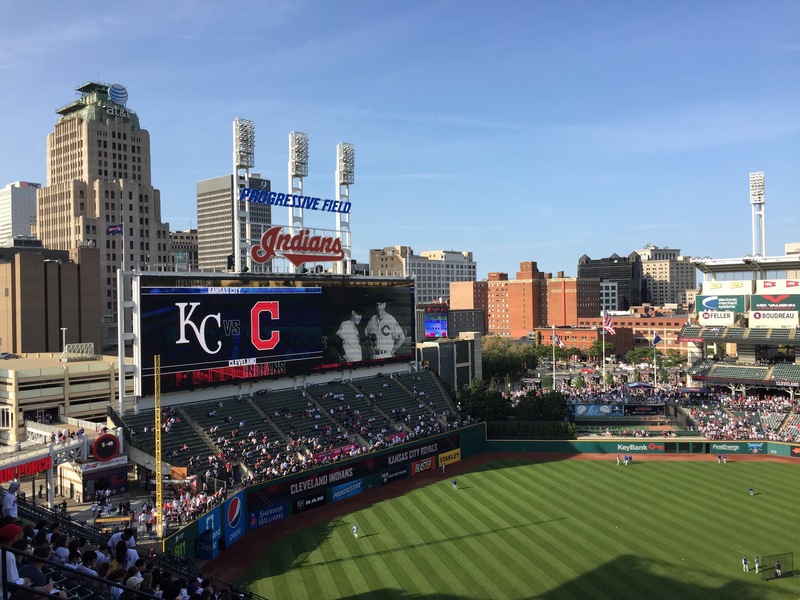 But when it comes to the Cleveland Indians, the fates simply are not kind, and no amount of heartfelt beseeching of the baseball gods is going to change that. So last night after the game ended we tossed and turned and slept poorly, fretting about this latest disappointment. It’s kind of embarrassing to react so strongly to a sporting event, when our rational sides know that it is after all just a game that pales in comparison to the really important things in life — but that’s what sports fans do. We give our hearts to a team, willing to endure the angst of losses and thinking that when our team does win we’ll recoup that investment a hundredfold. We just can’t help feeling deeply affected by these kinds of painful losses — and with the star-crossed Indians, the celebration of ultimate triumph still hasn’t come and seems as unlikely as ever. Time will give us some perspective, and Tribe fans will always have that wonderful winning streak to remember, just like Rick and Ilsa will always have Paris. But for now we’ve just watched another potential championship climb into a plane with the New York Yankees and fly away. Boy, it really stings! Yesterday afternoon the Cleveland Indians won their 100th game of the year, beating the Minnesota Twins 5-2. The Tribe got another terrific starting pitching performance, this time from Carlos Carrasco, who pitched 8 shutout innings, struck out 14 batters, and now stands at 18-6 on the year. 100 wins is a nice round number. It’s also an historic achievement of sorts. This is only the third time in their 100-plus year history that the Indians have won 100 games in a season, and it took an historic winning streak to do it. And in baseball generally, 100-win seasons don’t necessarily happen every year. Eight teams in the big leagues have never won 100 games, and these days the economics of the game tend to discourage team owners and general managers from assembling the combination of talent that can win 100 games, because it’s going to be expensive and there’s a good chance that lots of the players will be moving on, leaving you to rebuild from scratch. Better to aim for those teams that can consistently win 90 games and that you can hold together over a few years. In our modern world, we tend to measure every athletic team by whether they won it all, and regular seasons are eclipsed by the playoffs, where short series and bad breaks can bring down dominant teams. Many 100-win teams haven’t won the World Series, and this year — because both the Dodgers and the Indians have reached that number — there will be at least one more 100-win team that doesn’t win it all. That’s just the way the ball bounces in baseball. But, for the true fan, what happens in the post-season shouldn’t detract from what happens during the regular season. Baseball is a marathon, and winning 100 games takes focus, careful management, and meaningful contributions from everybody on the roster. It’s a true team accomplishment, because during those 100 wins different players are going to have to step up and make the big hit, or the tremendous fielding play, or the crucial pitch to allow another W to go into the record books. 2017 has been a remarkable year for the Cleveland Indians, and a marvelous year for those of us who are long-time fans of the Tribe. Here’s hoping it continues!